“When someone dies they die in peace. - the feel of their hugs. It’s a privilege to be able to spend time with your deceased loved one until the final disposition of the body. Lucy believes that it is at this threshold we connect spiritually with our ancient memories that yearn to help our deceased loved ones “even to the grave.” You will never regret being present for these final moments. Family-Directed funerals are legal in all states with the exceptions of Connecticut, Illinois, Indiana, Iowa, Louisiana, Michigan, Nebraska, New Jersey, and New York. But even in these nine states there can be priceless quiet, sacred time spent with your deceased loved one prior to final dispensation of the body. Assigning a family member to be the designated funeral director is necessary in filling out and signing the legal documents while other family members may participate in the care and preparation of the body. These simple final acts of kindness may include washing, anointing, dressing and laying out the body on a table or bed for a two or three day vigil. Keeping the body cool is paramount through the use of dry ice, Techni Ice or ice packs. However, in cooler climates, opening a window so that the room is between 45 and 50 degrees may be all that you need. Lucy has been teaching Introduction to Home Funerals and Natural Burials in northwestern Wisconsin, empowering families to make choices concerning after-death-care while avoiding the economic burdens of the funeral industry. 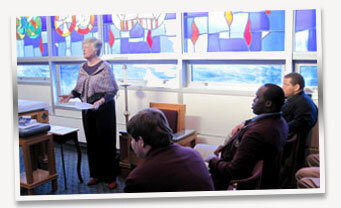 Three day Death and Dying presentation for seniors at DeMatha Catholic High School, Hyattsville, Maryland. The natural burial process requires that what is buried in the ground is exclusively biodegradable. Burying on your own property may be governed by local laws so you should consult with your County Zoning Administrator prior to planning the burial. The websites listed below are invaluable resources of information. 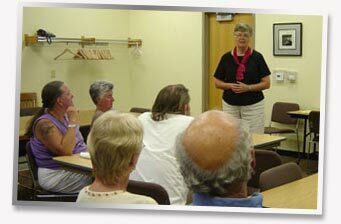 Community Education Intro to Home Funerals/Natural Burials class. Advance Planning: Power of Attorney for Health Care, Living Wills, Ethical Wills, and Declaration of Final Disposition in advance of your death. Participants conclude the session with a walk through the nearby Sacred Grove. Level II includes the Level I class plus an additional day. This level is for those who want to teach others about after-death care. If you are interested in taking these classes, please contact Lucy. www.greenburialcouncil.org: The Green Burial Council is a nonprofit organization working to encourage more environmentally sustainable deathcare and the use of burial as a means of protecting natural areas. The GBC has established the first eco-certification program for cemeteries, funeral homes, product, and cremation disposition programs and has a network of 300 "approved providers" operating in the US and Canada. finalpassages.org - Final Passages is a model organization since 1995, offering education about personal and legal rights concerning home or family-directed funerals and final disposition (burial and cremation). It is our intention to re-introduce the concept of funerals in the home as a part of family life and as a way to de-institutionalize death. We are dedicated to a dignified and compassionate alternative to current funeral practices.